Introduction: The American Joint Committee on Cancer (AJCC) tumor-node-metastasis (TNM) Staging Manual has been updated and provides more specified stage grouping for prostate cancer (PCa). In this study, we aimed to evaluate the accuracy of the updated AJCC stage groups for PCa using a cohort of patients who underwent radical prostatectomy (RP). Materials: We analyzed the data of 3,032 patients previously treated with RP for localized PCa. 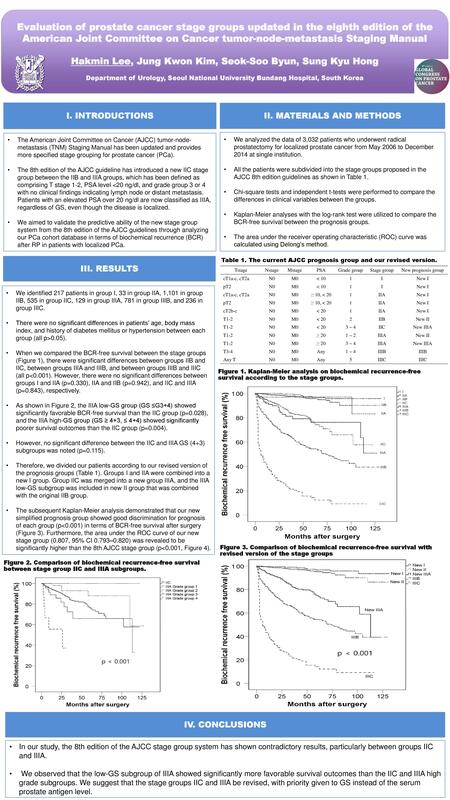 We stratified patients into stage groups according to the 8th edition of the AJCC manual and compared biochemical recurrence (BCR)-free survival using Kaplan-Meier analyses. Results: There were 217 patients in group I, 33 in group IIA, 1,101 in group IIB, 535 in group IIC, 129 in group IIIA, 781 in group IIIB, and 236 in group IIIC. 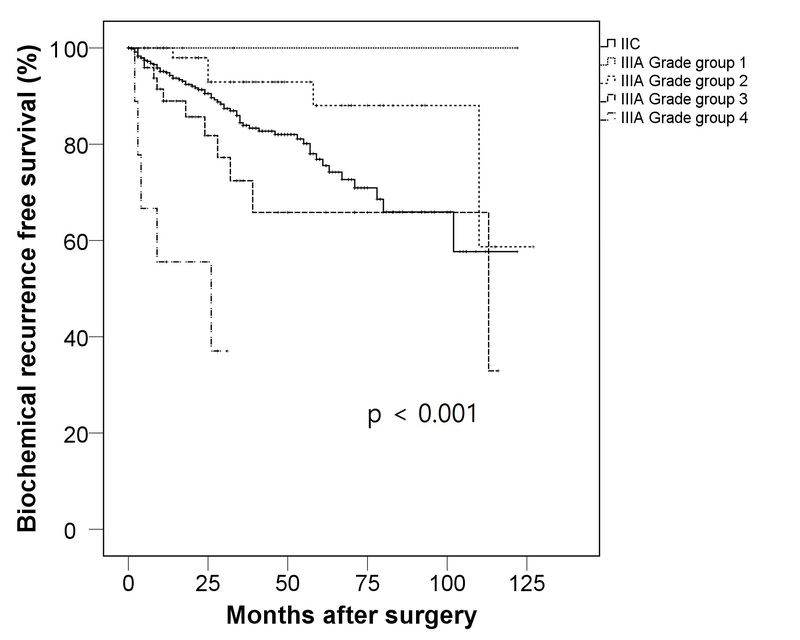 There were no significant differences in BCR-free survival between groups IIC and IIIA (p=0.875). Subsequently, the low-GS IIIA subgroup (GS≤3+4, p=0.025) showed superior BCR-free survival than the IIC group, and the high-GS IIIA subgroups (GS≥4+3, p=0.004) showed a poorer BCR-free survival than the IIC group. Furthermore, there were no significant differences between groups I and IIA (p=0.330) and between groups IIA and IIB (p=0.942). When patients were re-stratified according to our new stage group system, a significantly improved ability to discriminate between groups was observed. Conclusion: The current AJCC prognostic groups show some contradictory results, particularly concerning prognosis of the IIC and IIIA groups. We suggest that GS be given more weight than the serum prostate antigen level in stage group stratification.